Multilayer networks, in particular multilayer social networks, where different types of actors belong to and interact on different contexts - such as multiple online social media, are an active research area in social network analysis, computer science, and physics. These networks have traditionally been studied within these (and other) separate research communities, leading to the development of several independent models and methods to deal with the same set of problems. 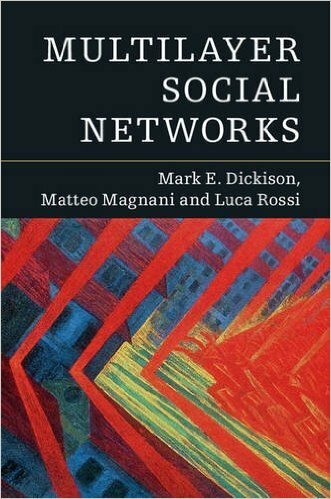 This book unifies and consolidates existing practical and theoretical knowledge on multilayer networks including data collection and analysis, modeling, and mining of multilayer social network systems, the evolution of interconnected social networks, and dynamic processes such as information spreading. A single real dataset is used to illustrate the concepts presented throughout the book, demonstrating both the practical utility and the potential shortcomings of the various methods. Researchers from all areas of network analysis will learn new aspects and future directions of this emerging field. The book is intended to be an introduction to the topic, accessible to people with different backgrounds. To reach this objective, it has been written by a physicist, a computer scientist and a sociologist. In this website you find complementary material for the book, including datasets and software. Under Software we will also put the tutorial material on how to use our R library for multilayer network analysis (multinet). This book has been partly funded by MIUR FIRB grant RBFR107725.